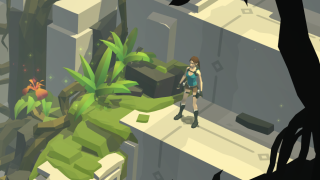 A trophy list for Lara Croft GO has been spotted by industry tipster / deals-finder extraordinaire / omniscient gamer Wario64, suggesting that the puzzle-based take on the Tomb Raider franchise will come to PS4 and Vita. If you haven't already played Lara Croft GO on iOS and Android, here's the jist: instead of full, unrestricted 3D exploration, Lara Croft GO places you in an almost board game-like environment, with paths clearly marking where you can go. The challenge is in moving through obstacles and enemies in the correct sequence, making sure you don't lead yourself into a spiked pit or the jaws of a man-sized iguana. Wario64 points out that the PS4 and Vita versions of Hitman GO - Square Enix's previous game to adapt a third-person action series into a turn-based puzzler - was announced at PlayStation Experience 2015. Logically then, it would make sense that we would see a similar announcement for Lara Croft GO at PlayStation Experience 2016, which starts this Saturday, December 3.